NEW YORK A New York State Supreme Court Judge has ordered Macy's (M), J.C. Penney (JCP) and Martha Stewart Living into mediation in a bid to resolve a dispute over a partnership with the Martha Stewart brand. The development Thursday comes as the companies were wrapping up the third week of a trial over whether Macy's has the exclusive rights to sell some Martha Stewart-branded merchandise, including bedding, cookware and bath items. Cincinnati-based Macy's sued New York-based Martha Stewart Living Omnimedia for allegedly breaching their long-standing contract when it signed a deal with J.C. Penney in December 2011. That deal was for opening Martha Stewart mini shops in most of Penney's stores this spring. In a separate lawsuit, Macy's sued Penney, which is based in Plano, Texas, claiming it had no regard for Macy's contract with Martha Stewart Living and that Penney was out to steal a business that Macy's had worked hard to develop. The two lawsuits were consolidated for the bench trial presided over by Judge Jeffrey Oing, who ordered the mediation. Among witnesses who have testified are Macy's CEO Terry Lundgren, Penney's CEO Ron Johnson and Martha Stewart, founder of Martha Stewart Living. Last July, Macy's won a preliminary injunction against Martha Stewart Living that would prevent it from selling Martha Stewart branded housewares and other exclusive products at Penney. 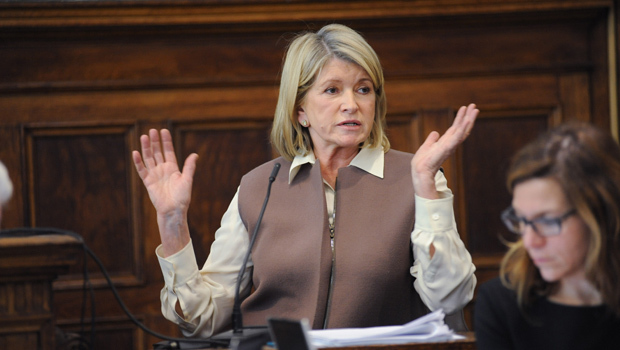 In August, the judge granted permission for Penney to open Martha Stewart shops as long as the items under exclusive contract with Macy's are not sold. Penney said Thursday it won't sell any products that are being designed by Martha Stewart and are deemed exclusive by Macy's before April 8, when the hearings are scheduled to resume. Penney has plans to sell products that are part of Macy's exclusive agreement in May, but the goods will be branded under "JCP Everyday," a new brand reserved for the Martha Stewart merchandise. But Macy's lawyers are seeking to extend the injunction to cover products labeled JCP Everyday. Penney also plans to sell products such as curtains and stationery that are not part of the exclusive Macy's contract under the label "Martha." In another breakthrough Thursday, officials at Martha Stewart Living confirmed Stewart and Lundgren had their first conversation since Dec. 6, 2011, when Stewart called Lundgren to inform him that she had signed a deal with Penney. Lundgren testified last week that he was so shocked that Stewart did not approached him in advance about the deal that he hung up on her. Stewart testified on Tuesday that she was "quite flabbergasted" when Lundgren hung up on her. On Thursday, Stewart and Lundgren had "a productive conversation regarding the ongoing contract dispute," Martha Stewart Living said in statement prior to the judge's order that the parties enter into mediation. "We view today's actions as a positive step forward and welcome a prompt and fair resolution," the statement added.